The Canadian always loved volunteering, and after running her own modelling agency and working as a nurse, she was looking for a way to follow her idol, Mother Teresa, and dedicate her life to charity. Then fate came knocking when she won a lifetime salary of C$1,000 (£605) a week in the Quebecois lottery "Gagnant à vie", or "winner for life". "At first I couldn't believe it, but I didn't celebrate or shout it from the rooftop because I had made a promise to the universe and I was determined to keep it. "I wanted to do something I loved for the rest of my life. I wanted to help others," she says. "Let's say that you have clothes to give away. We will put you in contact with a family that needs those clothes and will allow you to go give them yourself," Ms Lapierre explains. "It's not only about material things. You might end up driving a cancer patient to a doctor's appointment." It's a far cry from Ms Lapierre's former career in the more glamorous, and some might argue consumerist, world of modelling. "I thought modelling was for tall blondes with blue eyes and I was short and brunette... But I am so glad I entered, it was a great experience." "Running my own business taught me about accounting and how to manage employees," Ms Lapierre says. She closed the business in the late 1980s to focus on bringing up her four children, but also dedicated herself to voluntary work - making numerous trips with humanitarian organisations to places like India and Haiti. This year, the charity has made 15,000 "direct actions" in Quebec, ranging from furnishing an apartment for a family of Syrian refugees, to finding a home for a homeless mother who had just given birth. She has also funded the organisation - which has 10 full-time volunteers and its own board - entirely by herself, investing $70,000 to date. "This weekly C$1,000 I get from the lottery allows me to not go to work anymore and finance my organisation," she says. "I pay for things such as our office rent and other administrative costs." There are limits to Ms Lapierre's budget, though. 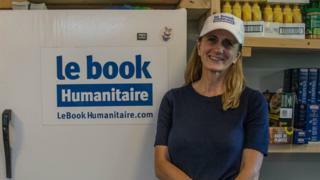 After she was interviewed by a popular Quebecois television station earlier this year, Le Book Humanitaire saw a huge increase in its Facebook followers, from around 4,000 to more than 20,000. It needs to open several new facilities to store donated items, but Ms Lapierre can't afford to do this alone. "We are counting on municipalities to lend us offices and make donations," she says. "But there are always ways to make things work." "The main difficulty is money and getting funding," says Mr Tchang, who worked with Ms Lapierre earlier in her volunteering career. "You also have to know your limits. You can start feeling overwhelmed by all the work and forget oneself... I am sure Rachel's nights must be very short." She continues to get joy from her work, which, she says "is nothing like running a regular business" and instead "feeds her soul". "Volunteering work represents billions of unrecorded dollars across the world. Without it, the world would not function."